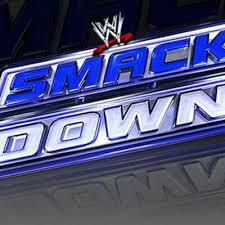 Join us for live updates of tonight’s SmackDown airing on SyFy starting at 8 p.m. ET (5 p.m.) PT. * WWE champ Seth Rollins opens the show but is soon confronted by Cesaro. Neville is the next to come out and ambushes Cesaro. Rollins finishes Neville back inside the ring. * Charlotte (with Becky Lynch) vs. Naomi (with Tamina & Sasha Banks) — Charlotte submits Naomi with a Figure-8. * Ryback comes out and shows us a picture of the staph infection that took him off his feet recently. He lets us know he’s back. * Luke Harper (with Bray Wyatt) vs. Roman Reigns (with Dean Ambrose) — It turns into an all out brawl with all four of them outside the ring and Reigns is declared the winner via disqualification. * Sheamus is interviewed backstage about getting RKO’d by Randy Orton Monday night. * New Day vs. PrimeTime Players — After taking some punishment New Day tries to leave but is confronted by Lucha Dragons and Los Matadores. PTP throw Xavier Woods back in the ring and Darren Young pins him. * Neville, Cesaro vs. Seth Rollins, Kevin Owens — Cesaro gets rolled up for the pin by Rollins as he’s trying to put Owens in the Swing. Cesaro gets payback and Rollins takes off. Neville hits a Red Arrow on Owens who was left to fend for himself.